The Army, Air Force, and Marines have hundreds of enlisted jobs, while the Navy only has a few ratings. It may look that way at a glance, but the reason is that many jobs are classified within the individual ratings. The Navy Enlisted Classification (NEC) system is how the Navy arranges its jobs (ratings). The NEC system supplements the enlisted rating structure in identifying personnel on active or inactive duty and billets in manpower authorizations. NEC codes identify a non-rating wide skill, knowledge, aptitude, or qualification that must be documented to identify both people and billets for management purposes. An NEC is an "advanced specialty" within a job. The other services also use the "advanced specialty within a job" system, in one way or another, but not to the extent that the Navy uses their NEC system. For example, in the Army, "Operating Room Specialist", and "Radiology Specialist" are two separate jobs (MOS 68D and 68P, respectively). The same is true of the Air Force (AFSCs 4N1X1 and 4R0X1). In the Navy, an operating room specialist and a radiology specialist hold the same rating (job)—that of HM (Hospitalman). The Navy knows which HMs to assign to Navy operating rooms and which HMs to assign to X-ray sections of the hospital by their NEC associated with their HM rating. If an HM receives advanced training as a surgical technologist, he/she is then awarded the NEC of HM-8483, and can thereafter be assigned duty assisting Navy surgeons. If a sailor with an HM rating receives advanced training as an x-ray technician, he/she would be awarded the NEC of HM-8451, or HM-8452, and then be assigned to work with Navy radiologists. A motivated sailor can become trained in several NECs within their Rating and become highly valuable within a command as well as be an above average candidate for advancement within that rating. Below are some of the most popular NECs in the Navy and a short description from the official Navy Bureau of Personnel NEC Update (Apr 2017). Air Traffic Controller (AC): Navy ACs man control towers at a variety of naval aviation facilities, including US stations, expeditionary airfields in war zones, and those magnificent floating cities, aircraft carriers. Builder (CB): Also known as "Sea-Bees," the men and women of the BU rate are part of the Naval Construction Force and the nickname comes from when the Navy Builders were part of the Construction Battalions (CB). Construction Electrician (CE): Also part of the Sea-Bee community, Construction Electricians are first responsible for the producing and maintaining the electric power needed to build and operate all military facilities on a base or forward operating base. Hospital Corpsman (HM): Hospital corpsmen perform duties in the prevention and treatment of disease and injury and assist health care professionals in providing medical care to Navy personnel and their families. An HM can work either in the lab or hospital or they also serve as battlefield corpsmen with the Marine Corps and Special Operations, providing emergency medical treatment in a combat environment. Machinist's Mate (MM): Machinist's Mates are mechanics and machine operators who operate and maintain engines and machinery used for ship propulsion and auxiliary machinery. They also maintain auxiliary machinery outside of main machinery spaces, such as electro-hydraulic steering engines and elevators, refrigeration plants, air conditioning systems, and desalinization plants. 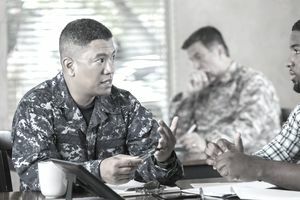 Master at Arms (MA): The Master at Arms rating provides the Navy with security specialists who perform anti-terrorism, force protection, physical security, and law enforcement duties on land and at sea. MA’s are the Navy’s police, security, and force protection professionals. Nuclear Field (NF): There are three ratings in the Navy Nuclear Field, including nuclear-trained MMs, EMs, and ETs who all perform duties in nuclear propulsion plants operating reactor control, propulsion and power generation systems. The NF provides opportunities to work closely with specialists in the nuclear, technology, and engineering fields. Operations Specialist (OS): Operations Specialists operate and supervise the operation of radar, NTDS, communications and associated equipment in the exercise of air control functions. They also ensure the correct positioning of aircraft in specified areas, air corridors, and approach or departure tunnels. An additional duty, along with the Navy Search and Rescue Technician, is to participate in search and rescue and aircraft emergency operations. Quartermaster (QM): U.S. Navy Quartermasters are experts in navigation. They stand watch as assistants to officers of the deck and the navigator and also serve as helmsman and perform ship control, navigation and bridge watch duties. Special Warfare (Navy SEAL, SWCC, EOD-Special Ops / Diver) Navy SEALs (SO): Special Warfare Combatant Crewman (SB), Explosive Ordnance Disposal (EOD) and Navy Diver (ND) are the four ratings under Naval Special Warfare / Operations. They all have become their own ratings since 2006.